Over the past few months we have worked with EXPO SpA, the local institutions and the BIE (Bureau International des Expositions) to create a revolutionary new concept of the world exposition. We are convinced that a visionary and successful EXPO has to abandon the outmoded idea of an exposition built around complex systems of representation and gigantic architectural monuments which often have no real purpose after the event. Instead EXPO 2015 will be remembered for giving visitors a direct and immediate experience of all aspects of the question of food. It will be an EXPO that embodies its theme-Feeding the Planet, Energy for Life-directly within its own space, with none of the usual simulations and documentation that can easily be found today on any computer. Secondly, it will be an EXPO that overturns the whole concept of monumentality: in place of giant structures (like the Eiffel Tower of Paris 1898), Milan will build a new landscape of monumental lightness and natural beauty. An environment that reflects the environmental sustainability, technical precision and haunting beauty of Venice’s winding alleys, Leonardo’s canals and the open countryside of rice fields and vineyards. The EXPO we envisage will be a Planetary Botanical Garden open to the citizens of Milan and the world. A place for a fresh encounter between farming and the city that will feed Milan literally, spiritually and intellectually. A vast agrofood park built on an orthogonal grid, surrounded by water ways and punctuated by striking landscape architecture. The principle behind this new Planetary Garden is the urban plan of Roman towns with their twin axes, the Cardo and the Decumanus, that extraordinary paradigm consisting of two perpendicular streets with a Forum at the centre which has for centuries been the model for thousands of cities across the world. The first axis, 1.4 kilometres long, laid in the same direction of the ancient Sempione road, will be a broad boulevard where visitors can stroll or cycle, comparable in size to the Ramblas in Barcelona or the Champs Elysées in Paris. It will become the symbol of EXPO 2015, at once a thoroughfare and a square where people from all over the world will meet together in Milan. At the centre of this axis a large Planetary Table will allow people to rest, gaze at the pavilions and sample the food produced and offered by the different countries represented. A second perpendicular axis will reflect the geometries of the farmlands that surrounds Milan. It will serve as the basis for the subdivision into lots for the national pavilions which will face onto the central axis, each with the same area of land regardless of their geopolitical power. The two axes will create a vast open grid of spaces. Some of these will be developed by the EXPO organisation, others by the individual countries themselves. It is our firm belief that the participation of many nations at EXPO Milan must not become an excuse for a futile vanity fair of architectural rivalry. As such the EXPO grid must serve as a simple platform for sober debate and exchange of ideas, designs and products on the theme of food. The pavilion lots will host crops and farm products that exemplify the sovereignty of each nation’s contribution to meeting the challenge of feeding the world’s people—experimental crops, orchards, gardens, greenhouses, food processing pavilions—where visitors can see (and taste) for themselves the entire life cycle of the food we eat. The national pavilions will be grouped together according to their geo-climatic conditions. Around the site perimeter, large climate controlled greenhouses will reproduce the Earth’s main biomes (tropical rain forest, the tundra, the Mediterranean, the extremes of the poles and the desert…). They will be the point of departure for the various countries’ cultivated plots, an extraordinary attraction for visitors to Milan 2015 who will be able to experience first-hand the planet’s many climates and natural habitats with their diversity of vegetation and wildlife. At each end of the main axis the site will be further enhanced by a large Arena-Theatre and a vast green hill built using earth from the excavations. Thematic Pavilions dealing with the major issues and challenges of the world’s food (malnutrition, genetics, proximity farming, wastage by rich countries, bio crops and so on) will serve as counterpoint to the grid of national pavilions. Running around the entire perimeter of the EXPO will be a series of navigable waterways with a phytodepuration system to collect and clean water from the various canals. These will act as functional / ecological elements of a single living system, as well as landmarks for visitors. Once again, we have tried to give greater priority to the overall landscape than to individual buildings. For this reason we wanted to give equal attention to the legacy of the EXPO as to the engineering and design aspects. A Masterplan that is flexible in its architectural features, but built on a robust layout and structure, to lay the basis for a whole new district of the city that will arise around a large open, green and productive area of land. The EXPO will thus leave the city the gift of a site that for years to come will celebrate the fundamental message of “feeding the planet”, providing “energy for life”. 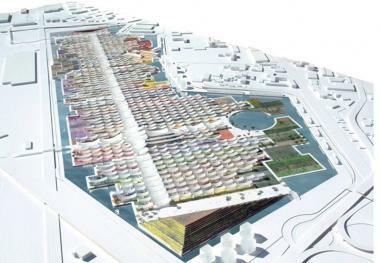 In this same spirit of trying to valorise existing resources, focusing on the question of food and at the same conscious of costs, we wanted to extend the living energy of the EXPO site to the whole metropolitan area. We therefore rethought the Water Ways project to focus attention and resources on the reclamation and redevelopment of that extraordinary patrimony of public and municipal farmsteads which dot the Milanese countryside and the network of canals that flow through it. These farms, whose original purpose was to produce fresh fruit and vegetables for the city, are also used today to accommodate the poorest sections of the Milanese population. A vast scheme to regenerate Milan’s municipal farmsteads will therefore not only revive their historic role of mediation between the city and the countryside, but also enhance their community function to host (in a system of residential accommodation involving agro-tourism and bed & breakfasts) some of the visitors to EXPO 2015. Equally, we have reworked the Land Ways project, tracing a pedestrian and cycle route through the heart of the city (part of which already exists) linking all of Milan’s major cultural, artistic and scientific attractions. A series of sights and institutions of international excellence linked in a Path of Knowledge and Culture (long as the site central boulevard) where EXPO 2015 visitors will be able to relive once again the memorable experience done in the exposition site. Through the restoration of the farmsteads and the valorisation of Milan’s excellence, the city will be imbued with the spirit of EXPO 2015 starting as early as the next few months. But, as with nature, the EXPO site will also be subject to change over time. The masterplan will serve as the guiding concept for an open process of collective planning. Beginning next year EXPO 2015 SpA will be launching a series of major international competitions involving not just the participating countries and institutions, but architects, designers, artists, and agronomists from every part of the world. A process starting today to realise in 2015 a place of huge emotional and architectural impact, but also a place for sober reflection and attention to the costs. A place where millions of visitors will be given an immediate and unforgettable experience and an opportunity to see with their own eyes the many and varied solutions that countries, farmers and companies from across the planet can offer to right the great imbalances in the world’s food supply.